SPECIALS - Auto Wheel Services, Inc. The Master Lock SteelCor™ No. 3036DAT features a 48in bungee cord with flat, steel I-beam hooks. The hooks are three times stronger than traditional bungee cord hooks. The reverse hook design provides extra room for fastening. The premium quality rubber cord offers superior strength and elasticity. ​The Master Lock No. 1480DAT features a 5/8in (16mm) Class III/IV stainless steel Barbell™ receiver lock. The receiver lock includes the Push to Lock™ locking mechanism, easily used by pushing the lock body firmly onto the pin and removing the key. The Weather Tough® seal and water tight cap provides additional protection from moisture and dirt. The Limited Lifetime Warranty provides peace of mind from a brand you can trust. The Master Lock No. 719D Cable Lock is 3ft (91cm) long and features a 3/16in (5mm) diameter braided steel cable for strength and flexibility. The protective vinyl coating protects against scratches. The integrated padlock features a 1-1/8in (29mm) wide laminated steel body for maximum strength and reliability. The 4-pin cylinder prevents picking and the dual locking levers provide resistance against prying and hammering. The Limited Lifetime Warranty provides peace of mind from a brand you can trust. The Master Lock SteelCor™ No. 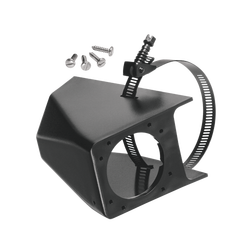 3032DAT features a 18in (45.7cm) bungee cord with flat, steel I-beam hooks. The hooks are three times stronger than traditional bungee cord hooks. The reverse hook design provides extra room for fastening. The premium quality rubber cord offers superior strength and elasticity.